Final Fantasy XIII [lower-alpha 1] is a science fiction role-playing video game developed and published by Square Enix for the PlayStation 3 and Xbox 360 consoles and later for the Microsoft Windows operating system. 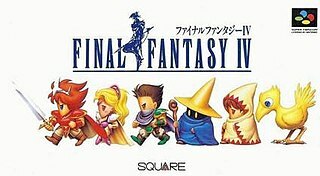 Released in Japan in December 2009 and worldwide in March 2010, it is the thirteenth title in the mainline Final Fantasy series. The game includes fast-paced combat, a new system for the series for determining which abilities are developed for the characters called "Crystarium", and a customizable "Paradigm" system to control which abilities are used by the characters. Final Fantasy XIII includes elements from the previous games in the series, such as summoned monsters, chocobos, and airships. Claire Farron, better known by the codename Lightning, is a fictional character from Square Enix's Final Fantasy series. She first appeared as a playable character and protagonist in the role-playing video game Final Fantasy XIII, in which she features as a resident of the artificial world of Cocoon. After her sister Serah is declared an enemy of Cocoon, Lightning attempts to save her. She and others are then chosen by the fal'Cie, a divided race of demigods who rule the worlds of Gran Pulse and Cocoon, to destroy Cocoon. Lightning reappears as a supporting character in Final Fantasy XIII-2, acting as protector of the Goddess Etro. She is the sole playable character in Lightning Returns: Final Fantasy XIII, wherein she sets out to save her world, which is destined to end in thirteen days. 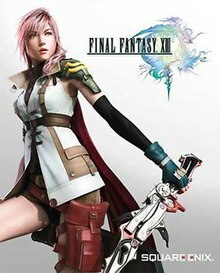 Outside the XIII series, Lightning has been featured in multiple Final Fantasy games and had cameo appearances in other video games. Development began in 2004, and the game was first announced at Electronic Entertainment Expo (E3) 2006. Final Fantasy XIII is the flagship title of the Fabula Nova Crystallis collection of Final Fantasy games and is the first game to use Square Enix's Crystal Tools engine. Final Fantasy XIII received mostly positive reviews from video game publications, which praised the game's graphics, presentation, and battle system. The game's story received a mixed response from reviewers, and its linearity compared to previous games in the series was mostly criticized. Selling 1.7 million copies in Japan in 2009, Final Fantasy XIII became the fastest-selling title in the history of the series. As of 2017, the game has sold over 7 million copies worldwide on consoles. The Microsoft Windows version has sold over 746,000 copies according to SteamSpy. A sequel, titled Final Fantasy XIII-2 , was released in December 2011 in Japan and in February 2012 in North America and PAL regions. A second sequel, titled Lightning Returns: Final Fantasy XIII , which concludes Lightning's story and the Final Fantasy XIII series,  was released in November 2013 in Japan and in February 2014 in North America and PAL regions. In September 2014, Square Enix announced the Final Fantasy XIII series has been widely successful and has shipped over 11 million copies worldwide. Fabula Nova Crystallis Final Fantasy is a series of games within the Final Fantasy video game franchise. It was primarily developed by series creator and developer Square Enix, which also acted as publisher for all titles. While featuring various worlds and different characters, each Fabula Nova Crystallis game is ultimately based on and expands upon a common mythos focusing on important crystals tied to deities. The level of connection to the mythos varies between each title. The series title translates from Latin as 'The New Tale of the Crystal'. Each development team was given the freedom to adapt the mythos to fit the context of a game's story. A player character is a fictional character in a role-playing game or video game whose actions are directly controlled by a player of the game rather than the rules of the game. The characters that are not controlled by a player are called non-player characters (NPCs). The actions of non-player characters are typically handled by the game itself in video games, or according to rules followed by a gamemaster refereeing tabletop role-playing games. The player character functions as a fictional, alternate body for the player controlling the character. The Chocobo is a fictional species from the Final Fantasy video game series made by Square and Square Enix. The creature is generally a flightless bird, though certain highly specialized breeds in some titles retain the ability to fly. It bears a resemblance to casuariiformes and ratites, capable of being ridden and otherwise used by player characters during gameplay. Chocobos first appeared in Final Fantasy II and have been featured in almost all subsequent Final Fantasy games, as well as making cameo appearances in numerous other games. A spin-off Chocobo series featuring chocobos has also been created. In Cocoon, the citizens of the town of Bodhum are being evicted, or Purged, after coming in contact with something from Pulse. Over the course of the game, the player is shown flashbacks of the events of the previous thirteen days, which began when a fal'Cie from Pulse was discovered near Bodhum. Lightning's sister Serah had found the fal'Cie from Pulse and been changed into a l'Cie by it. Lightning and Sazh derail a Purge train bound for Pulse in an attempt to save Serah. As Snow leads his resistance group NORA to rescue the Purge exiles, several of them are killed. Heading to the fal'Cie Anima to save Serah, Snow is joined by two of the exiles: Hope and Vanille. The two parties meet at the fal'Cie, and find Serah just as she turns to crystal. Anima then brands them as l'Cie and they are cast out into a different part of Cocoon. During this transformation, the newly crested l'Cie all have the same vision: a monster called Ragnarok. Arguing over the ambiguous nature of the dreamed Focus, the party finds Serah in her crystallized form; Snow remains with her as the others leave. Snow meets Cid and Fang, two members of the Cavalry, after he is captured and detained aboard the airship Lindblum. Meanwhile, the others flee from PSICOM before getting separated by an airstrike; Hope and Lightning travel to Palumpolum, while Sazh and Vanille travel to Nautilus. In Lightning's scenario, she unintentionally supports Hope's goal of killing Snow to avenge his mother's death. In Vanille's scenario, Sazh discusses how his son Dajh was turned into a l'Cie by a Cocoon fal'Cie and was taken by PSICOM to discover his Focus. In Palumpolum, Lightning attempts to dissuade Hope from going through with his revenge and meets Snow and Fang. Fang reveals that she and Vanille were l'Cie from Pulse who were turned into crystals; they were turned back into humans 13 days earlier, sparking the Purge. Hope attempts to murder Snow, but after being rescued during an airstrike, he decides not to go through with it. The four then flee the city with Cid's aid. In Nautilus, Vanille reveals herself to Sazh as a l'Cie from Pulse, and indirectly the reason that Dajh was turned into a l'Cie. Sazh and Vanille are then captured and detained on board the airship Palamecia. The party infiltrates Cocoon and heads towards Orphan but soon discover that the Cavalry have been turned into Cie'th. The party defeats Barthandelus, but Orphan awakens and merges with Barthandelus, then compels Fang to finish her Focus as Ragnarok while the others are seemingly transformed into Cie'th. The party reappears in human form, preventing Fang from transforming. The party defeats Orphan  and escapes Cocoon, which is now falling towards Pulse. As the rest of the party turns to crystal for completing their Focus, Vanille and Fang remain on Cocoon and transform into Ragnarok together to prevent a collision between Cocoon and Pulse. The rest of the party awaken from their crystallization on Pulse and find their l'Cie brands gone; Lightning, Hope, Snow and Sazh reunite with Serah and Dajh. Final Fantasy XIII-2 is a role-playing video game developed and published by Square Enix for the PlayStation 3 and Xbox 360. Released in 2011 in Japan and 2012 in North America and PAL regions, it is a direct sequel to the 2009 role-playing game Final Fantasy XIII and is part of the Fabula Nova Crystallis subseries. A port to Microsoft Windows was released on Steam in December 2014 followed by iOS and Android in September 2015. XIII-2 includes modified features from the previous game, including fast-paced combat and a customizable "Paradigm" system to control which abilities are used by the characters, and adds a new system that allows monsters to be captured and used in battle. It features a heavy time travel element, allowing the player to jump between different times at the same location or different places at the same time. 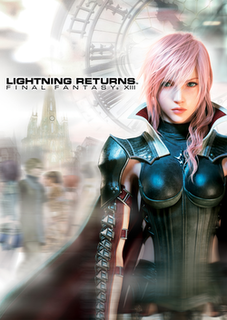 Lightning, the protagonist of the original game, has disappeared into an unknown world. Her younger sister Serah Farron, a returning character, and a young man named Noel Kreiss, journey through time in an attempt to find Lightning. Daisuke Watanabe is a Japanese video game writer employed by Square Enix. He is mostly known for his work on the role-playing video game series Final Fantasy and the action RPG series Kingdom Hearts. Lightning Returns: Final Fantasy XIII is an action role-playing video game developed and published by Square Enix for the PlayStation 3 and Xbox 360. It was released in November 2013 for Japan and February 2014 for North America, Australia and Europe. A port to Microsoft Windows through Steam was released in December 2015 followed by iOS and Android in Japan during February 2016. The game is a direct sequel to Final Fantasy XIII-2, concludes the storyline of Final Fantasy XIII, and forms part of the Fabula Nova Crystallis subseries. Lightning Returns employs a highly revamped version of the gameplay system from the previous two games, with an action-oriented battle system, the ability to customize the player character's outfits, and a time limit the player must extend by completing story missions and side quests. Jun Akiyama is a Japanese video game event director and scenario writer who works at Square Enix. He joined the predecessor company Square in 1995. In his role as event planner for Final Fantasy VII, Akiyama was responsible for the story elements and cutscenes involving the characters Red XIII and Yuffie Kisaragi, respectively. During his work as the event director of Vagrant Story, he intended to make the transitions between gameplay and event scenes as smooth as possible. The fully polygonal graphics of the game entailed precise camera movements, character animations and the usage of different lens effects. Final Fantasy Type-0, an action role-playing game developed and published by Square Enix in 2011, revolves around a war between four nations in the world of Orience. An episodic companion game, Final Fantasy Agito, was released in 2014. Type-0 was re-released internationally in 2015 as a high-definition remaster for PlayStation 4 and Xbox One. The main protagonists are Class Zero, a group of students at the magical academy in Rubrum. The story is told through two new members of Class Zero: Machina Kunagiri and Rem Tokimiya. The main character of Agito is a player-created cadet at the Rubrum magical academy. The world and characters were designed by Yusuke Naora, Yusaku Nakaaki and Tetsuya Nomura. Their stories were created by Hajime Tabata, Hiroki Chiba and Sarah Obake. 1 2 Shreier, Jason (September 18, 2014). "Final Fantasy XIII Is Coming To PC". Kotaku . Gawker Media. Archived from the original on September 18, 2014. Retrieved September 18, 2014. ↑ Goldfarb, Andrew (September 11, 2012). "Lightning Returns Will Be the Last Final Fantasy XIII". IGN. Archived from the original on September 12, 2012. Retrieved November 19, 2012. ↑ Square Enix, ed. (2010). Final Fantasy XIII North American instruction manual. Square Enix. p. 10. ↑ Square Enix, ed. (2010). Final Fantasy XIII North American instruction manual. Square Enix. p. 16. ↑ Square Enix, ed. (2010). Final Fantasy XIII North American instruction manual. Square Enix. p. 19. ↑ Square Enix, ed. (2010). Final Fantasy XIII North American instruction manual. Square Enix. p. 12. 1 2 Cullen, Johnny (September 8, 2010). ""No reason" to bring FFXIII 360 International Edition west, says Square Enix". VG247. Archived from the original on December 3, 2010. Retrieved August 2, 2011. ↑ "Final Fantasy XIII for PlayStation 3 system". Square Enix. Archived from the original on August 5, 2008. Retrieved October 10, 2008. 1 2 3 "Final Fantasy XIII Update". IGN . News Corporation. April 8, 2009. Archived from the original on April 13, 2009. Retrieved January 4, 2011. 1 2 3 Gudmundson, Carolyn (March 4, 2010). "Final Fantasy XIII Review". GamesRadar. Archived from the original on July 1, 2010. Retrieved June 30, 2010. 1 2 3 4 5 6 Welsh, Oli (March 5, 2010). "Final Fantasy XIII". Eurogamer. Archived from the original on May 7, 2011. Retrieved June 30, 2010. 1 2 "Final Fantasy XIII Official Website". Square Enix. Archived from the original on March 26, 2010. Retrieved January 4, 2011. ↑ Clements, Ryan (June 2, 2009). "Final Fantasy XIII Preview". IGN . News Corporation. Archived from the original on June 11, 2009. Retrieved July 16, 2009. ↑ Lee, Garnett (August 20, 2009). "Final Fantasy XIII Preview". 1UP.com . Ziff Davis. Archived from the original on May 7, 2011. Retrieved September 8, 2009. ↑ Pigna, Kris (November 1, 2009). "Final Fantasy XIII Character Growth System Explained". 1UP.com . Ziff Davis. Archived from the original on May 7, 2011. Retrieved November 1, 2009. ↑ Piggyback Interactive, ed. (2010). Final Fantasy XIII The Complete Official Guide. Piggyback Interactive. p. 154. ISBN 978-0-307-46837-6. ↑ Square Enix, ed. (2010). Final Fantasy XIII North American instruction manual. Square Enix. pp. 36–37. ↑ Bramwell, Tom (November 12, 2009). "FFXIII's Crystarium system detailed". Eurogamer. Archived from the original on May 7, 2011. Retrieved December 23, 2010. ↑ Square Enix (March 9, 2010). Final Fantasy XIII. PlayStation 3, Xbox 360. Square Enix. Datalog - Sanctum Fal'Cie: The Sanctum fal'Cie are the unfathomable entities that constructed the floating shell of Cocoon in ages past, and even now watch over the world's human inhabitants. Each is assigned a specific task that supports the existence of Cocoon's grateful populace, such as generating energy or manufacturing food. ↑ "Final Fantasy XIII - E3 2008: MS Press Conference Cam Trailer". GameTrailers. July 14, 2008. Archived from the original on June 21, 2009. Retrieved October 10, 2008. ↑ Winkler, Chris (July 16, 2009). "New FFXIII Details Announced". RPGFan. Archived from the original on May 7, 2011. Retrieved September 8, 2009. ↑ Square Enix (March 9, 2010). Final Fantasy XIII. PlayStation 3, Xbox 360. Square Enix. Datalog - The War of Transgression: Several hundred years ago, the armies of Pulse attempted to invade Cocoon in a conflict known today as the War of Transgression. The Sanctum fal'Cie were able to repel the lowerworld forces before they breached Cocoon's interior, but not before they managed to seriously damage areas lying near the world's outer rim. ↑ Square Enix (March 9, 2010). Final Fantasy XIII. PlayStation 3, Xbox 360. Square Enix. Datalog - Lowerworld Artifacts: In the aftermath of the War of Transgression, regions near Cocoon's outer rim were left uninhabitable due to the severe trauma they had sustained. To undo the damage, the fal'Cie gathered materials from the surface of Pulse and rebuilt Cocoon's wounded landscape with them. ↑ Square Enix (March 9, 2010). Final Fantasy XIII. PlayStation 3, Xbox 360. Square Enix. Datalog - PSICOM: The Sanctum military is composed of two main branches: the Guardian Corps, responsible for maintaining security in various jurisdictions throughout Cocoon, and PSICOM– Public Security and Intelligence Command. PSICOM is an elite special operations unit charged with protecting Cocoon from Pulsian incursion. ↑ Square Enix (March 9, 2010). Final Fantasy XIII. PlayStation 3, Xbox 360. Square Enix. Datalog - AMP Technology: Humans ordinarily lack the means to wield magic, but through the use of manadrives[...] it is possible to synthesize the effects. ↑ Square Enix (March 9, 2010). Final Fantasy XIII. PlayStation 3, Xbox 360. Square Enix. Datalog - Lightning: Lightning was formerly a sergeant in the Guardian Corps, Bodhum Security Regiment. 1 2 Square Enix (March 9, 2010). Final Fantasy XIII. PlayStation 3, Xbox 360. Square Enix. Datalog - Serah Farron: Serah is Lightning's younger sister and Snow's fiancee. Also a Pulse l'Cie, she has gained eternal life and slumbers in crystal stasis. [...] her task was simply to gather the tools for Cocoon's destruction. ↑ Square Enix (March 9, 2010). Final Fantasy XIII. PlayStation 3, Xbox 360. Square Enix. Datalog - Snow Villiers: Snow[...] leads the rebellious group of youths known as NORA. 1 2 Square Enix (March 9, 2010). Final Fantasy XIII. PlayStation 3, Xbox 360. Square Enix. Vanille: My name is Oerba Dia Vanille. I am a l'Cie from Gran Pulse. And to everyone on Cocoon... ...evil. ↑ Square Enix (March 9, 2010). Final Fantasy XIII. PlayStation 3, Xbox 360. Square Enix. Datalog - Nora Estheim: Nora is Hope's mother. Worried about the worsening relationship between her son and his father, Nora wonders how to break down the barriers Hope has created. ↑ Square Enix (March 9, 2010). Final Fantasy XIII. PlayStation 3, Xbox 360. Square Enix. Datalog - The Sanctum: [...]fal'Cie opt to participate only superficially in governmental affairs, leaving Cocoon's administration entirely at the discretion of the human Sanctum and its Primarch, Galenth Dysley. ↑ Square Enix (March 9, 2010). Final Fantasy XIII. PlayStation 3, Xbox 360. Square Enix. Datalog - The Purge: The recent discovery of a fal'Cie from Pulse[...] caused widespread civil unrest. [...]The Sanctum then announced its intent to forcibly relocate the affected to Pulse in an emergency measure dubbed by authorities as the Purge. ↑ Square Enix (March 9, 2010). Final Fantasy XIII. PlayStation 3, Xbox 360. Square Enix. Datalog - Branded: The mark seared on their bodies[...] it is the brand of a cursed l'Cie. [...]Their only clue is the vision they all witnessed of a great beast laying waste to Cocoon. Ragnarok. ↑ Square Enix (March 9, 2010). Final Fantasy XIII. PlayStation 3, Xbox 360. Square Enix. Datalog - Operation Nora: Operation Nora[...] the means by which he will exact vengeance on Snow. [...]Lightning soon realizes her mistake. Her lecture to abandon compassion was intended as a warning against the hesitation she fears will be his undoing. ↑ Square Enix (March 9, 2010). Final Fantasy XIII. PlayStation 3, Xbox 360. Square Enix. Sazh: My son Dajh. He was picked. He's a l'Cie. He said he wanted to see a fal'Cie. So, I took him on a tour of the Euride Gorge plant. Thought I surprised him with a Chocobo chick to take home, but the second I turned my back... ...into the energy plant he went. ↑ Square Enix (March 9, 2010). Final Fantasy XIII. PlayStation 3, Xbox 360. Square Enix. Fang: I've got a few screws loose, but I'm a l'Cie, same as you. Difference being... ...I wasn't born on Cocoon. I'm from Gran Pulse. The 'world below' you all hate so much. My partner and I'd turn to crystal and gone to sleep. But when we came around, here we were. The reason Cocoon's in such an uproar is the same reason that you're here now. Vanille and I woke up. ↑ Square Enix (March 9, 2010). Final Fantasy XIII. PlayStation 3, Xbox 360. Square Enix. Datalog - Sustained by Hate: It is his hatred of Snow that has been sustaining him through countless battles. In a strange way, the man who made a promise to his mother has been protecting him all along. [...]Operation Nora is over. ↑ Square Enix (March 9, 2010). Final Fantasy XIII. PlayStation 3, Xbox 360. Square Enix. Dysley: Oh child, perish the thought. I am more than that! Barthandelus: I am fal'Cie. My name is Barthandelus. Voice of the Sanctum, and Lord-Sovereign of the Cocoon fal'Cie. ↑ Square Enix (March 9, 2010). Final Fantasy XIII. PlayStation 3, Xbox 360. Square Enix. Datalog - Orphan: As Sanctum fal'Cie and l'Cie are incapable of harming Orphan, Barthandelus requires the assistance of Pulse l'Cie. ↑ Square Enix (March 9, 2010). Final Fantasy XIII. PlayStation 3, Xbox 360. Square Enix. Datalog - Helping Hands: The l'Cie who became Ragnarok and attacked Cocoon during the war was[...] Fang herself. ↑ Square Enix (March 9, 2010). Final Fantasy XIII. PlayStation 3, Xbox 360. Square Enix. Lightning: Maybe Cocoon is past saving, but it's our home. And we'll protect it, or die trying! We live to make the impossible possible! That is our Focus! 1 2 Final Fantasy XIII Scenario Ultimania (in Japanese). Tokyo: Studio Bentstuff. February 1, 2010. pp. 496–499. ISBN 978-4-7575-2775-1. ↑ Sato (November 4, 2013). "The Final Fantasy XIII Project Was Originally Called "Colors World"". Siliconera. Archived from the original on November 5, 2013. Retrieved November 5, 2013. 1 2 3 4 Final Fantasy XIII Scenario Ultimania (in Japanese). Tokyo: Studio Bentstuff. February 1, 2010. pp. 388–390. ISBN 978-4-7575-2775-1. ↑ "『ファイナルファンタジーXIII REMINISCENCE -tracer of memories-』著者、渡辺大祐氏にインタビュー" [Final Fantasy XIII: Reminiscence -tracer of memories-: Interview with author Daisuke Watanabe]. Famitsu . July 11, 2014. Archived from the original on July 11, 2014. Retrieved July 11, 2014. 1 2 3 Smith, Luke (June 7, 2006). "FFXIII Interview: Nomura, Kitase, Hashimoto and Toriyama". 1UP.com . Ziff Davis. Archived from the original on May 7, 2011. Retrieved October 24, 2009. ↑ Gantayat, Anoop (November 8, 2006). "Final Fantasy XIII Update". IGN . News Corporation. Archived from the original on December 27, 2007. Retrieved November 10, 2006. ↑ Yip, Spencer (December 31, 2009). "Final Fantasy XIII: Behind The Textures". Siliconera. Archived from the original on May 4, 2010. Retrieved September 11, 2010. 1 2 3 4 5 Toriyama, Motomu; Maeda, Akihiko (October 2010). "Post Mortem Final Fantasy XIII". Game Developer . 17 (9): 24–29. ISSN 1073-922X. ↑ Jeremy Parish (May 6, 2014). "Where Final Fantasy Went Wrong, and How Square Enix is Putting It Right". USGamer. Archived from the original on May 8, 2014. Retrieved May 8, 2014. ↑ Yin-Poole, Wesley (February 19, 2014). "Square Enix "definitely interested" in bringing future Final Fantasy games to PC". Eurogamer. Archived from the original on February 19, 2014. Retrieved February 19, 2014. ↑ Sloderbeck, Matt (May 6, 2006). "Square Enix Pre-E3 Event Features New Games, New Details". RPGamer. Archived from the original on August 1, 2008. Retrieved October 10, 2008. ↑ Roper, Chris (May 8, 2006). "E3 2006: Final Fantasy XIII Official". IGN . News Corporation. Archived from the original on November 12, 2007. Retrieved May 8, 2006. ↑ Brudvig, Erik (May 8, 2006). "E3 2006: Eyes-on Final Fantasy XIII Trailer". IGN . News Corporation. Archived from the original on October 15, 2007. Retrieved October 10, 2008. ↑ Final Fantasy XIII Battle Ultimania (in Japanese). Tokyo: Studio Bentstuff. January 28, 2010. pp. 306–308. ISBN 978-4-06-204397-7. 1 2 Gantayat, Anoop (May 9, 2006). "E3 2006: FFXIII Staff Check". IGN . News Corporation. Archived from the original on April 3, 2008. Retrieved December 15, 2008. ↑ Moses, Tenacious (February 27, 2007). "New details on Final Fantasy Versus XIII". GamePro. Archived from the original on March 25, 2009. Retrieved October 10, 2008. 1 2 Yip, Spencer (March 18, 2010). "Final Fantasy XIII Director Answers Your FFXIII Questions". Silconera. Archived from the original on September 26, 2010. Retrieved September 11, 2010. ↑ Bramwell, Tom (June 7, 2006). "FF to look like Advent Children?". Eurogamer. Archived from the original on June 24, 2009. Retrieved July 27, 2008. ↑ Final Fantasy XIII Battle Ultimania (in Japanese). Tokyo: Studio Bentstuff. January 28, 2010. pp. 528–531. ISBN 978-4-06-204397-7. ↑ Bettenhausen, Shane (July 16, 2009). "E3 2008: One More Final Fantasy XIII Interview". 1UP.com . Ziff Davis. Archived from the original on May 7, 2011. Retrieved October 25, 2009. ↑ 1000号記念スペシャル表紙プロジェクト. Famitsu (in Japanese) (1001): 42–45. February 8, 2008. ↑ Tanaka, John (October 21, 2009). "Final Fantasy XIII Update". IGN . News Corporation. Archived from the original on May 7, 2011. Retrieved October 27, 2009. 1 2 Final Fantasy XIII Scenario Ultimania (in Japanese). Tokyo: Studio Bentstuff. February 1, 2010. pp. 50–52. ISBN 978-4-7575-2775-1. 1 2 Final Fantasy XIII Scenario Ultimania (in Japanese). Tokyo: Studio Bentstuff. February 1, 2010. pp. 96–98. ISBN 978-4-7575-2775-1. ↑ Gordon, Jon (February 8, 2010). "Exclusive Final Fantasy XIII Interview". Play . Archived from the original on July 18, 2013. Retrieved December 29, 2013. 1 2 Yip, Spencer (January 13, 2010). "Nora's Secret Base And Lightning's Home Cut From Final Fantasy XIII". Silconera. Archived from the original on June 6, 2010. Retrieved June 30, 2010. 1 2 Final Fantasy XIII Ultimania Omega (in Japanese). Tokyo: Studio Bentstuff. October 4, 2010. pp. 508–511. ISBN 978-4-7575-2958-8. ↑ Dutka, Ben (March 23, 2009). "Advent Children Blu-Ray Set For June In North America". PSXExtreme. Archived from the original on March 27, 2009. Retrieved March 29, 2009. ↑ Tanaka, John (August 1, 2008). "Final Fantasy XIII Demo Announced". IGN . News Corporation. Archived from the original on August 22, 2008. Retrieved October 10, 2008. ↑ Gordon, Jonathan (August 20, 2009). "GC 09 Final Fantasy XIII Interview". NowGamer. Archived from the original on May 7, 2011. Retrieved December 21, 2010. ↑ Leadbetter, Richard (March 5, 2010). "Digital Foundry: Face-Off: Final Fantasy XIII". Eurogamer. Archived from the original on May 8, 2011. Retrieved March 5, 2010. ↑ Greening, Chris (September 30, 2009). "Lots More Final Fantasy XIII Music Details". Square Enix Music Online. Archived from the original on May 7, 2011. Retrieved November 8, 2009. ↑ "Final Fantasy XIII Original Soundtrack Information". Square Enix Music Online. September 30, 2009. Archived from the original on January 2, 2010. Retrieved November 8, 2009. ↑ Marfuggi, Antonio (November 13, 2009). "Final Fantasy XIII – The Time Has Come". Sony. Archived from the original on May 7, 2011. Retrieved April 15, 2010. ↑ Gann, Patrick (February 12, 2010). "Final Fantasy XIII OST". RPGFan. Archived from the original on May 7, 2011. Retrieved May 31, 2010. ↑ "『FF XIII』サウンドトラックが初日Top3入り" (in Japanese). Oricon. January 28, 2010. Archived from the original on May 7, 2011. Retrieved February 3, 2010. ↑ "W/F：Music from Final Fantasy XIII". Square Enix. Archived from the original on May 7, 2011. Retrieved May 31, 2010. ↑ "W/F：Music from Final Fantasy XIII -Gentle Reveries-". Square Enix. Archived from the original on May 7, 2011. Retrieved May 31, 2010. ↑ "Final Fantasy XIII Original Soundtrack Plus". Square Enix Music Online. Archived from the original on May 7, 2011. Retrieved May 31, 2010. ↑ Greening, Chris (July 21, 2010). "Final Fantasy XIII Piano Collections". Square Enix Music Online. Archived from the original on May 7, 2011. Retrieved July 21, 2010. ↑ Gann, Patrick (December 12, 2009). "Sayuri Sugawara - Because You're Here". RPGFan. Archived from the original on December 30, 2009. Retrieved May 31, 2010. ↑ "Final Fantasy XIII Elixir発売に関するお知らせ" (in Japanese). Square Enix. September 8, 2009. Archived from the original on May 7, 2011. Retrieved September 29, 2009. ↑ "『Final Fantasy XIII』パーソナルスペース、期間限定で無料！" (in Japanese). Sony Computer Entertainment. January 13, 2010. Archived from the original on May 7, 2011. Retrieved June 30, 2010. ↑ "Final Fantasy XIII Comes to PlayStation Home + Sodium Updates, Indiana Jones Items & a Huge Sale!". Sony Computer Entertainment. March 10, 2010. Archived from the original on October 7, 2010. Retrieved March 12, 2010. ↑ Gantayat, Anoop (August 31, 2012). "Full Final Fantasy 25th Anniversary Ultimate Box Game List". Andriasang. Archived from the original on September 21, 2013. Retrieved October 2, 2012. ↑ Spencer (June 6, 2013). "Japan's Lightning Ultimate Box Has All Three Final Fantasy XIII Games". Siliconera. Archived from the original on September 20, 2013. Retrieved October 13, 2013. ↑ Clements, Ryan (September 23, 2009). "TGS 09: Final Fantasy XIII PS3 Bundle". IGN . News Corporation. Archived from the original on May 7, 2011. Retrieved January 4, 2011. ↑ Watts, Steve (January 22, 2010). "Square Announces PAL Final Fantasy XIII Collector's Edition". 1UP.com . Ziff Davis. Archived from the original on May 7, 2011. Retrieved February 1, 2011. ↑ "スクウェア・エニックス e-STORE -ブック-" (in Japanese). Square Enix. Archived from the original on May 7, 2011. Retrieved February 1, 2011. ↑ Final Fantasy XIII Battle Ultimania (in Japanese). Tokyo: Studio Bentstuff. January 28, 2010. ISBN 978-4-06-204397-7. ↑ Final Fantasy XIII Scenario Ultimania (in Japanese). Tokyo: Studio Bentstuff. February 1, 2010. ISBN 978-4-7575-2775-1. ↑ Final Fantasy XIII Ultimania Omega (in Japanese). Tokyo: Studio Bentstuff. October 4, 2010. ISBN 978-4-7575-2958-8. ↑ "Final Fantasy XIII here for PS3 only". AsiaOne. January 31, 2010. Archived from the original on February 2, 2010. Retrieved January 4, 2011. ↑ Ashcraft, Brian (August 9, 2010). "Japan Finally Getting Final Fantasy XIII On The Xbox 360". Kotaku . Gawker Media. Archived from the original on May 9, 2013. Retrieved March 24, 2014. ↑ "『「PlayStation 3」 Final Fantasy XIII 中文版決定發售！』 2010年 5月發售預定！" (in Chinese). Sony Computer Entertainment. February 5, 2010. Archived from the original on May 7, 2011. Retrieved February 6, 2010. ↑ Gantayat, Anoop (September 8, 2010). "Final Fantasy XIII Xbox 360 Confirmed For Japan". IGN. Archived from the original on May 7, 2011. Retrieved September 11, 2010. 1 2 "Final Fantasy XIII for PlayStation 3 Reviews". Metacritic . CBS Interactive. Archived from the original on May 7, 2011. Retrieved February 9, 2010. 1 2 "Final Fantasy XIII for Xbox 360 Reviews". Metacritic . CBS Interactive. Archived from the original on May 7, 2011. Retrieved February 9, 2010. 1 2 "Final Fantasy XIII for PC Reviews". Metacritic . CBS Interactive. Archived from the original on March 17, 2015. Retrieved January 9, 2015. 1 2 3 4 5 6 7 Parish, Jeremy (March 5, 2010). "Final Fantasy XIII Review for the PS3". 1UP.com . Archived from the original on May 7, 2011. Retrieved June 30, 2010. 1 2 3 4 5 6 Jackson, Mike (March 5, 2010). "Review: Final Fantasy XIII Review". Computer and Video Games. Archived from the original on May 7, 2011. Retrieved June 30, 2010. 1 2 3 4 5 6 "Review: Final Fantasy XIII". Edge . March 5, 2010. Archived from the original on May 7, 2011. Retrieved June 30, 2010. 1 2 Reilly, Jim (December 8, 2009). "First Final Fantasy Review Score Not So Perfect". IGN . News Corporation. Archived from the original on May 7, 2011. Retrieved December 8, 2009. ↑ Juba, Joe (March 5, 2010). "Square Enix Delivers A Great Game, Not A Savior - Final Fantasy XIII - PlayStation 3 - www.GameInformer.com". Game Informer. Archived from the original on January 30, 2015. Retrieved January 8, 2012. 1 2 3 4 VanOrd, Kevin (March 5, 2010). "Final Fantasy XIII Review for PlayStation 3". GameSpot. Archived from the original on March 7, 2010. Retrieved March 5, 2010. ↑ Peckham, Matt (March 5, 2010). "Final Fantasy XIII Review". GameSpy. Archived from the original on August 25, 2014. Retrieved April 5, 2013. ↑ Clements, Ryan (March 8, 2010). "Final Fantasy XIII Review". IGN . News Corporation. Archived from the original on May 7, 2011. Retrieved March 8, 2010. ↑ McCarthy, David (February 2010). "Final Fantasy XIII". PlayStation Official Magazine (39): 100–103. ↑ Winterhalter, Ryan. "Final Fantasy XIII (Import) review". Nowgamer. Archived from the original on May 7, 2011. Retrieved June 30, 2010. ↑ Alexander, Leigh (December 18, 2009). "FFXIII Tops 1 Million Units Day One". Gamasutra. Archived from the original on May 10, 2010. Retrieved December 18, 2009. ↑ "Nintendo Dominates, Software Sales Rebound in Japan". 1UP.com . Ziff Davis. January 13, 2010. Archived from the original on May 7, 2011. Retrieved January 4, 2011. ↑ "2010 Top 100 Console Software in Japan". The Magic Box. Archived from the original on August 12, 2014. Retrieved February 4, 2015. ↑ Gantayat, Anoop (December 17, 2009). "Final Fantasy XIII Nears 2 Million". IGN . News Corporation. Archived from the original on May 7, 2011. Retrieved January 4, 2011. ↑ Sharkey, Mike (March 19, 2010). "Final Fantasy XIII: Biggest First Week in Franchise History". GameSpy. Archived from the original on May 7, 2011. Retrieved March 19, 2010. ↑ Clements, Ryan (April 15, 2010). "Final Fantasy XIII Leads on PS3". IGN . News Corporation. Archived from the original on May 7, 2011. Retrieved April 20, 2010. ↑ Ishaan (December 22, 2011). "A Closer Look At Final Fantasy XIII-2′s Performance In Japan". Siliconera. Archived from the original on April 5, 2012. Retrieved April 5, 2012. 1 2 Prell, Sophie (January 18, 2013). "Lightning Returns: Final Fantasy XIII's creators justify a third game in a series with falling sales". Penny Arcade Report. Archived from the original on August 27, 2013. Retrieved May 8, 2013. ↑ "Final Fantasy XIII Series Announced for Windows PC". Square Enix. September 18, 2014. ↑ "Final Fantasy XIII on Steam". Steam Spy. Archived from the original on April 11, 2018. Retrieved December 12, 2018. ↑ "FF13：今週の雑誌にレビューなど、他天野氏イラスト" (in Japanese). Famitsu. December 2009. Archived from the original on July 23, 2011. Retrieved January 12, 2010. ↑ 【アンケート結果発表】2009年一番おもしろかったゲームランキングを発表！ (in Japanese). ASCII Media Works. January 2010. Archived from the original on May 7, 2011. Retrieved January 12, 2010. ↑ "Top Games Ever Made as Voted by Fans". Famitsu (in Japanese). 1104. January 2010. ↑ Watts, Steve (November 17, 2010). "Spike Video Game Awards Nominees List Revealed". 1UP.com . Ziff Davis . Retrieved May 13, 2011. ↑ "Award-Winning". Square Enix. 2010. Archived from the original on May 18, 2016. 1 2 Yin-Poole, Wesley (March 5, 2010). "Final Fantasy XIII Review for PS3". VideoGamer.com. Archived from the original on May 7, 2011. Retrieved June 30, 2010. 1 2 3 4 Kohler, Chris (March 5, 2010). "Review: Beautiful, Boring Final Fantasy XIII Loses RPG Magic". Wired News. Archived from the original on April 25, 2010. Retrieved June 30, 2010. 1 2 McElroy, Griffin (March 5, 2010). "Review: Final Fantasy XIII". Joystiq. Archived from the original on May 7, 2011. Retrieved June 30, 2010. 1 2 Glasser, A. J. (March 5, 2010). "Final Fantasy XIII Review from GamePro". GamePro. Archived from the original on May 7, 2011. Retrieved June 30, 2010. ↑ Ingham, Tim (February 16, 2010). "Final Fantasy XIII boss responds to review scores". ComputerAndVideoGames.com. Archived from the original on May 8, 2011. Retrieved June 30, 2010. ↑ Parish, Jeremy (February 22, 2010). "Final Fantasy XIII is Not an RPG". 1UP.com . Retrieved March 16, 2012. ↑ Nutt, Christian (July 26, 2011). "Q&A: The Real Story Behind Final Fantasy XIII-2". Gamasutra. Archived from the original on July 26, 2011. Retrieved July 26, 2011. 1 2 Nutt, Christian (July 12, 2010). "Square Enix in 2010: President Wada Speaks". Gamasutra. Archived from the original on November 9, 2010. Retrieved September 12, 2010. ↑ Roberts, Samuel (October 30, 2014). "Final Fantasy XIII Review". PC Gamer . Future. Archived from the original on July 2, 2016. Retrieved May 24, 2017. ↑ McWhertor, Michael (October 9, 2014). "Final Fantasy 13 comes to PC, but it's not getting a great reception". Polygon . Vox Media. Archived from the original on December 4, 2016. Retrieved May 24, 2017. ↑ Thoman, Peter (December 15, 2014). "Final Fantasy XIII and XIII-2 port analysis: Durante's verdict". PC Gamer . Future. Archived from the original on November 27, 2016. Retrieved May 24, 2017. ↑ "Final Fantasy 13-2 release date". GameRant. Archived from the original on July 8, 2012. Retrieved June 16, 2012. ↑ "Final Fantasy XIII-2 dated Special Edition PS3 announced". Gematsu. Archived from the original on March 31, 2012. Retrieved June 16, 2012. ↑ "ライトニングシリーズ最終章『ライトニング リターンズ ファイナルファンタジーXIII』が2013年に発売決定！【FF展リポート】" ["Final Fantasy XIII Lightning Returns" Lightning series final chapter will be released in 2013! (FF Exhibition Report)]. Famitsu (in Japanese). September 1, 2012. Archived from the original on March 1, 2013. Retrieved February 10, 2013. ↑ Sinan Kubba (June 6, 2013). "Lightning Returns: Final Fantasy XIII hits NA Feb 11 2014, EU Feb 14". Joystiq. Archived from the original on January 28, 2015. Retrieved June 6, 2013. Wikimedia Commons has media related to Final Fantasy XIII .